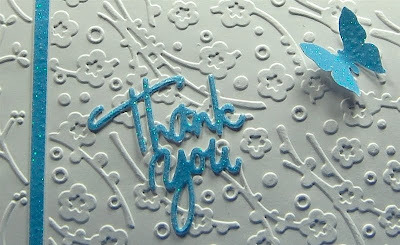 I can't seem to stop adding Cuttlebug embossing folders to my collection. I find the textures that they add to be so appealing. One of the newest collections to become available is the "Asian Bundle" which coordinates nicely with the Pagoda Cricut cartridge. Here is a LINK to the page on the Cricut.com site where you can see more information about the bundle. There are eight folders in the bundle, four are 5 x 7 inches (Plum Blossom, Oriental Weave, Kimiko, Bamboo) and four are A2 size (Japanese Scales, Mandarin Screen, Koi, Lanterns). I am not sure if they will be sold separately - I have only seen sold them as a bundle at this time. I ordered these folders from Creative Express and they arrived yesterday. The one I was most eager to try was the Plum Blossom, so I decided to make a quick card. I realized that this folder coordinates nicely with the widest border folder from the "Just my Type" set. 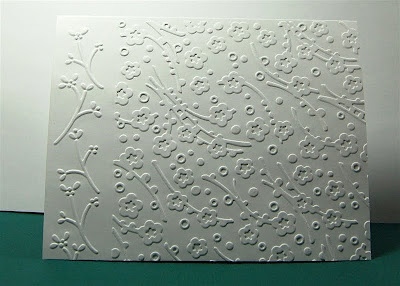 I embossed most of the front of an A2 card with the Plum Blossoms folder, leaving an area about an inch or so wide for the border. You could just leave the card plain - it is simple and elegant and would be nice for notes of all sorts. 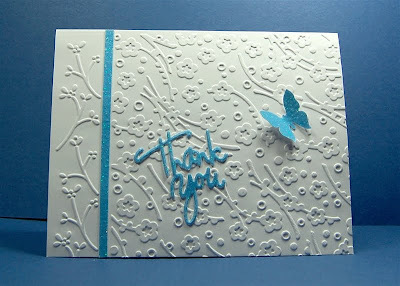 I added a thin strip of blue glitter cardstock between the two embossed sections and used the "Thank you" from the Cuttlebug "With Gratitude" A2 combo emboss and die set for a sentiment. The butterfly is the Martha Stewart "Royal Butterfly" punch. Just a quick post tonight - I have been working on a few "secret" projects that I can't show you just yet (but I think you will like them!). It is really cold here - at least we expect this weather in New England. I hope all my friends in the South are staying warm. really like the folder, but must try to stay away from purchases. last year was not great, but love the card you created. I think i like the space between the two embossed areas. "Enjoy" the snow. How cool is that folder? Just think, you'd could glitter up all of those purty lil' flowers!!! Thank you for the beautiful simple card that even I can make. I'm getting ready to make my first card this week and think I'll start with this one. Your ideas are so wonderful. I love your site and your explanation of "how to do it". awww, this is really darling!!!! I have this folder, but never thought of using it like that. GREAT idea! Thank you!